Have you ever lived with far too many roommates to save money? How about living in a school bus or working as a campground host? If you look around, you’ll find plenty of ways to save money on housing. But have you ever considered living on a boat? If you don’t mind small spaces and the thought of living on the water sounds appealing, this cost-saving strategy could save you big bucks while providing an interesting, and sometimes idyllic, living situation. One couple who went the boat route wound up saving a ton of money, they told Business Insider. Sam Train and Francesca Spidalieri originally decided to invest in a boat so they could own a home of sorts without having to worry about selling it as they followed Train’s career as a Naval officer around the country. Faced with the prospect of frequent moves, purchasing a boat made a lot more sense than investing in a piece of property and hoping the market was favorable to sell it when they had to move. Here’s a breakdown of the cost of living on a boat, from buying to maintaining it — and how it helps them save money. After some shopping around, Train and Spidalieri settled on a used 40-foot Catalina cruiser. They paid $150,000 for this portable, floating home, and each month the couple pays $800 toward the boat’s mortgage. When they first purchased the cruiser, they were living in Newport, Rhode Island, which they found was not the best location for year-round boat living. They spent about two months a year living on the boat, enjoying the sunny and warm summer months. But each time the fall chill set in, they retreated to a rental apartment where they lived for most of the year. However, the couple soon learned that Train’s Naval career would move them in San Diego, which is well-known for its year-round sunny and warm climate. Knowing this big cross-country move was ahead of them, the couple took some time to consider their options. They could rent an apartment in San Diego and leave the boat in Rhode Island, they could rent an apartment in San Diego and bring the boat with them, or they could skip the hassle and expense of renting an apartment and make the boat their home. To make their decision, they did the math. Rental apartments in San Diego were running up to $3,000 a month at the time, and the couple wanted to avoid that expense. 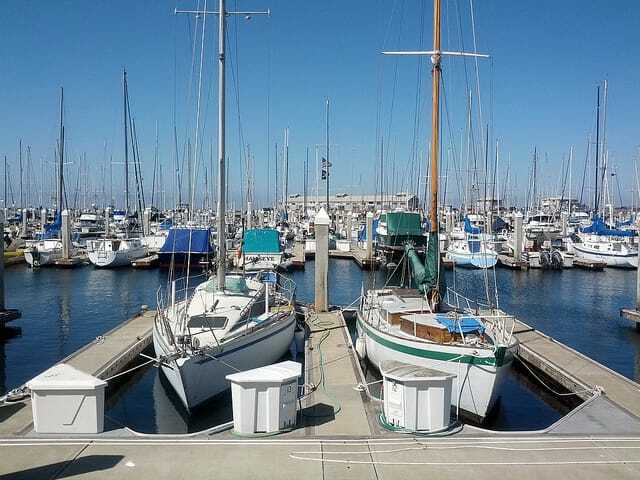 They calculated how much it would cost to leave their boat docked in Rhode Island while renting a place in San Diego, and came to the conclusion that it made the most financial sense to bring the boat with them to San Diego and live on it there. According to their calculations, living in their boat would save them $50,000 over the next three years. And, since the Navy was paying for their move, they were able to use their relocation allowance to foot the bill for shipping the boat to their new West Coast home. The couple recently broke down their living expenses for Business Insider. Each month, they pay around $2,200 to live on their boat. In addition to their monthly mortgage payment, they pay an $800 standard marina fee. They also pay an additional $250 supplement to live aboard their boat while it’s at the marina. This fee includes access to water, electricity, parking for both of their cars and other perks like a laundry room, a pool and mail delivery for both letters and packages. This saves them the hassle and expense of renting a post office box. Of course, living on a boat also includes a few unconventional expenses, such as the $25 they fork over each week to get their sewage tank pumped out. They also hire a pro to wash and wax their boat once a month to keep it in top shape; this costs about $80 each month. Every few months, they also hire a diver to swim under the boat and clean the underside, scraping barnacles and giving it a good scrub to make sure it stays seaworthy. And, just as cars can break down when you least expect them to, the couple is always prepared to cough over some cash for boat repair. Each year, they budget around $1,000 to attend to any unforeseen problems that may arise with the boat. Since storage is so tight on their boat (which is only 300 square feet), the couple also rents a storage unit where they keep the bulk of their worldly possessions. For $100 per month, they keep most of their clothing and extra linens in storage, as well as other items they use from time to time. But space just became a little tighter for this couple: They recently had a baby. Only time will tell if they stay on the boat or opt for a more conventional location to raise their family. Your Turn: Would you consider living on a boat if you could save this much money?